What type of horse property is right for you? Information and resources to assist horse owners locate the precise horse ranch to fit their family and horse needs. What makes for a good horse property for you? The location of the horse ranch is of prime importance. The key to understanding the location is all about local knowledge. Finding a local real estate team who are experts in horse properties will pay big dividends when searching the local landscape for that perfect equine home. Real estate purchases have many things to consider. The essentials of a good horse ranch vary based on the goals of the property owner. But the basic features of a horse ranch are barn, pasture, paddock, training area, fencing, feed and hay storage areas and of course a home for people to live in. All of these facets can be highly specialized or very basic just depending on the desires and budget of the property owner. The central point of most horse properties is the barn. The horses live in the barn. Morning begins in the barn. Every morning seeing the horses is one of the pleasures of having a horse property. Sometimes when boarding your horse, days can go by without seeing them. Feeding and caring for the horse many times happens in the barn. Horses can be born in a barn. The barn also houses the horse equipment. The barn is where you, on a stormy night, go to check on the horses. The barn is truly a shelter in the storm. Barns are a special part of a horse ranch. Some barns are painted to be works of art. But other barns have had all their paint worn away. Some barns look like they house million dollar horses and others block some wind and most of the rain. Barns can be very expensive build. Knowing what type of barn fits best with the horse owner’s needs is key to finding the just right horse property. Type of barn is just one part of a horse property checklist. There are many things to consider when buying a property for a family and horses. Organizing a horse property buyer’s check list can help with discovering the perfect horse ranch for the family and horses. Check out one of the most complete horse property check lists at HousingSacramento web site. Pastures are an expression of the horse property. Pastures are the places where the animals spend a lot of their day. Pastures can be rolling hills or fenced off blocks of area looking like horse cubicles. Seeing horses running across a pasture is one of the highlights of owning equine acreage. Feeling the ground pulse as the horses thunder by is feeling nature from the ground up. It is a sensation of power and awe. Pastures create a connection to the land, balancing what the horses take and what the land can give. The stability of the land, water and plant life all come together in harmony to create a pasture that is another joy of horse property ownership. Horse training areas are one of the contradictory parts of life. Work and play join together in the training areas. There is no question that a lot of work goes on in a round pen or arena. But when that horse achieves the desired action, the satisfaction of it is more like play then work. Some of the best times spent on the ranch are in the training areas. They create horse together time. In some training, the two become one. The mount and rider learn each other in the training areas. Arenas and round pens bring life to horse properties. They are relationship builders. They develop new skills both in the horse and the trainer. They are the place, after months of work, it happens. 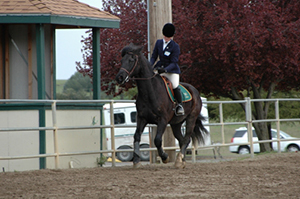 Every horse type has its own experience and therefore needs its own training areas. English and western each have their own requirements in the training areas. Gated, work horses, rescue, and trail horses all need training facilities. Training areas are as unique as the horse and the owners. Since the pastures are the picture of the horse property, the fencing is the frame. The fencing tells a story about the ranch. The bright white rails framing all aspects of the ranch display the property in a formal well-ordered way. A purposeful horse ranch with basic fences speaks of a practical narrative. Fences can be simple wire on driven in stakes to custom crafted wooden works of art. Fences can protect horses from many dangers or become a danger to the horse. The safety elements of horse fencing are about design, installation, materials and maintenance. Fences are more than looks only. They are the foremost safety element of the horse ranch. Building a safe environment for the horses is the desire of horse property owners. The direct care and safety are leading reasons why people want to own horse property. Fences play a big part in horse property ownership. The tack area of a horse ranch can make life easy or difficult. Keeping horse tack clean and ready to use is a big job. Having a tack area that will keep it clean and readily available is a major benefit. The tack area should be large enough to work on the tack and store them properly. This saves time and frustrations. Horse bridles, saddles, blankets, halters, and all the rest are amazing tools and it nice to appreciate them in a well-organized tack room. And having a safe and secure place to store and display them, adds value to any home. Horses eat a lot of nutrition each day. They are big animals. Having a hay barn and feed area that is the right size and easy to use will make the daily tasks so much simpler. Feed and hay areas should keep the food dry and be easy to load into also. Why make the animal care more difficult than it needs to be? What goes in the horse comes out differently. A good waste removal system can make the daily chore more acceptable. Waste can build to a powerful odor that takes some of the joy away from being with horses. Having the area away from the barn will help to mitigate the smell of animals waste and will add much to the everyday environment. Horse ranches that deal effectively with the waste issue also reduce the fly and other insect problems. There are many health benefits for both people and the animals to properly dealing with the waste matter. The home of a horse ranch is a major advantage of owning a horse property. Horse ranch homes have room around them. The home can be small or large and spread out. The ability to have the dream home is a major allure of horse properties. Horse property homes can handle a large family or even multigenerational families. Houses can have a county feel or be very formal. Horse owners range from very casual to high societal. The house can be in the center of the horse property. Or the house can be a short quad ride to the barn. Outdoor living is a core benefit of owning a horse ranch. The space around the home becomes part of the living area. Many homes have areas for outdoor cooking and barbeque, entertaining, sitting areas to enjoy nature and read, lawns, gardens, play grounds and many more types of outdoor space. Living outdoors becomes just as home as the house. Finding horse properties and information can be hard with the massiveness of data. Coffee Real Estate has quality information about horse ranch properties and our specialist horse property agents can find the right property for you and your horses. Sharing a home with horses makes a connection to nature. Horses have a unique relationship with people. Their intelligence and power are gracefully displayed every day. Their daily needs connect horse caregivers with life’s cycles. The reward of living with your horse is a daily bond that is rewarding to the person and the horse. Finding a horse expert to help answer the questions about local horse properties can be a difficult process. Northern California horse property real estate specialist agents at Coffee Real Estate are more than willing to help find the perfect horse ranch and answer questions about how to choose the right horse property for your family and horse needs. Horse ranches are as much about a life style as it is a place to live.